I’m here in Elim and I have no food in the house. Did you know that 20lbs of uncracked peanuts sells for about $14.50 US? Peanuts don’t weight that much. That’s a lot of peanuts. Value added products are almost always a good idea. ‘Maybe Jamaicans could start marketing their own peanut butter? ?’, I thought. Cooked, raw, honey added, salt free…Oh the butters we could make! Maybe we could go organic! How bad could this be?? I allotted an entire afternoon for experimentation. Hmm, looks like I need to add some oil…. “Blech!!!! !” – too much oil! There is more than one kind of peanut. At least four. As you may have guessed, not all peanuts make peanut butter. Turns out, the kind we have in Elim? Not for peanut butter. There is little hope in implementing a new kind of peanut around here since my community uses the nuts of this harvest as seeds for the next crop; cheaper and more efficient that way. Please start brainstorming various butter alternatives. 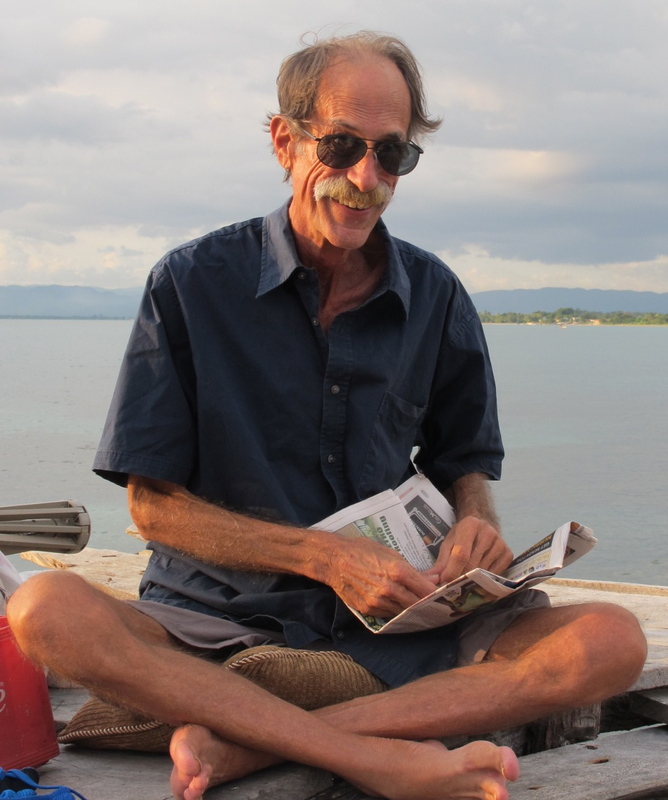 In severely more depressing news, a friend of Peace Corps and companion of mine, Tony, in Accompung, passed away last week. He had liver cancer and opted to stay in Jamaica living out his life rather than going through intensive and inconclusive radioactive treatment (for the second time). My blog is sarcastic and my transitions abrupt but I by no means intend any disrespect towards this man. On the night of his death I felt his presence around me and dreamt he was flying to heaven. If he heard that he would roll his eyes, laugh out loud, and say something sarcastic and crotchety — most likely about not believing in heaven. I have fond memories of him as a generous individual and am sad he is no longer with us. In absurdly-inappropriate positive news, my parents purchased a plane ticket for me to fly home! I am really looking forward to vacation. Also, this next week, the new Basic School is having its grand opening! My entire community is talking about it. They are so proud. It’s the first new building up in Elim in over 30 years! It is a huge accomplishment — Soon I will attach pictures of progress. It’s the start of a beautiful friendship. Speaking of beautiful friendships look who I saw yesterday! I have some friends who don’t like birds *cough cough* but…He’s green, and he’s hungry. I think these characteristics make him very relatable. 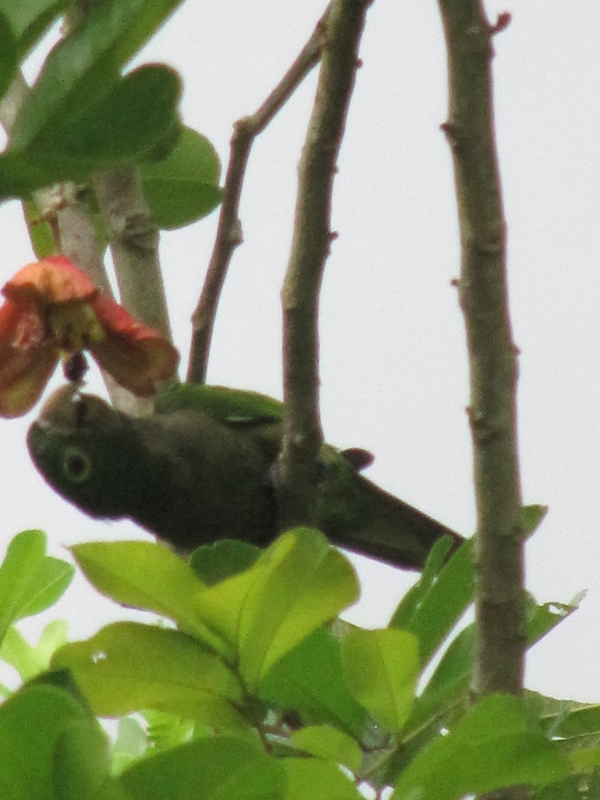 Here, parrots usually hang out in flocks; devouring guavas, ackee, and peanuts (most Jamaicans think them a nuisance). I rather envy their bottomless stomachs while admiring their lively color and dreaming of taking flight myself. But for now I will have to satiate my get-up-and-go desires through books. They take me to another world. This week I finished Song of Solomon by Toni Morrison (fabulous) and an awful book by Garrison Keillor albeit with a promising title, A Life in Comedy. I don’t list all my books for you all the time because, well, I have a heart. If you ever wanted to chat books, though, I welcome your input. Please be aware that I read what’s available. Do not offer suggestions (unless prepared to send me a copy) as it is inconvenient to obtain books living on an island with a low literacy rate and on an even lower volunteer-salary. In more personal reading-news, my dearest has started his own blog! It’s clever: “In the Pursuit of…” and he’s a wonderful writer. Nick told me he is not quite ready to make it open to fans so this is just a teaser. Feel free to harass him; it’s super fantastic and the public deserves access!!! Hopefully a link will soon come. Okay. That’s all I’ve got. I’m going to go put on my peanut-thinking-cap and stare at birds in motion. And that party was awesome, thanks for asking. You remember, right? That one that didn’t start until ‘the next day’. Well, yours truly went and stayed until 6am!!! I think I’m really integrating. -Walking a mile to get there in the dark. With potholes. I used my headlamp. -Cows ‘Moooo’ing as we passed. -Arriving, the party was in the middle of a field, completely outside. -Thus, the party was dark; lights came from parked cars pointed in the “party direction”. -Music was loud. Really, really loud. -Weed was sold for $2.50 US by the stick (about 2 feet). -Walking home I didn’t need my headlamp because the sun was already shining! I went to church (I’m dynamic like that) and struck up a conversation with a community member who did not attend the party. “Yup” I started cautiously, worried where this might go. This was, after all, my first all-night party and, being a teacher in this small village I do not want anything to slander my good name. Could I go and have a fabulous time yet still be conservative and maintain my reputation even in church??? “I heard that you danced but didn’t wine ’cause your hubby don’t want you to” she continued. “Yes, this is true.” I said as a smile crept across my face. I went to a party!!! And then, icing on my party cake, I went into Kingston and picked up MAIL!!! I received THREE awesome packages from four incredible people! (Tears happened when I read my birthday card messages because I miss you all so much — Luckily there was chocolate in the package so I was able to drown my sorrows right then and there). It was so thoughtful of you to organize and send this full-of-love present filled with good cheer! I have been relishing the change of scenery this box has brought into my home (I put the card up on my wall and it is a PLEASURE to open my fridge and see all these new, exciting, foreign contents!!). 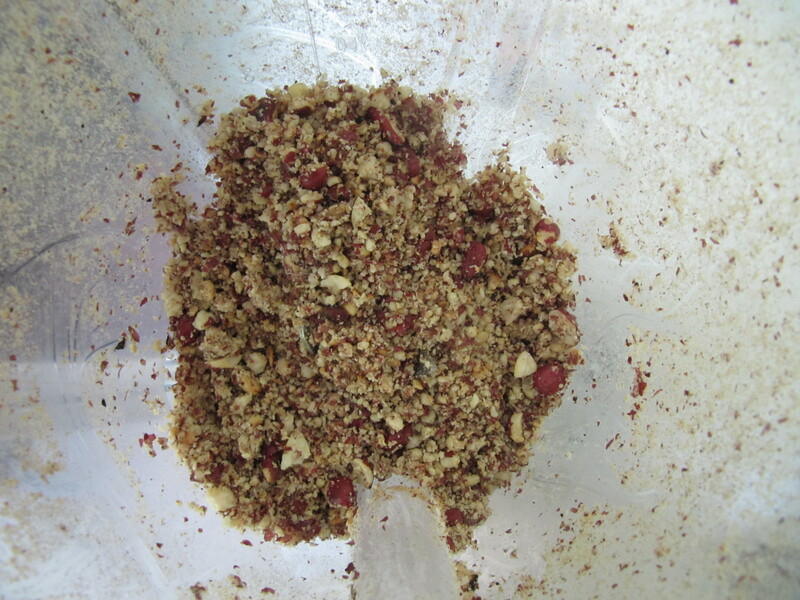 As you can probably imagine, I picked through the nut mix and ate out all of the chocolate already but am still holding out hope that I missed some pieces… Sick, I know. Your package full of gardening supplies finally made it here!! There was so much cool stuff in this box (the items just kept ‘one-upping’ each other, ha!). And, for those of you who have sent me packages in my past, that is, before I started a blog, I really appreciate those gifts as well [and hope I conveyed that to you in a very lengthy (if not public) and appreciative e-mail!]. I hope that your month is going as well as mine.